There are plenty of reasons why holidays to Malta are still so popular. The tiny archipelago is like a scattering of gems set in the Mediterranean’s diadem. Don’t let the tiny size (the entire country – one fifth the land area of London) discourage you from traveling and taking a holiday here, says travel writer Michael Roberts. 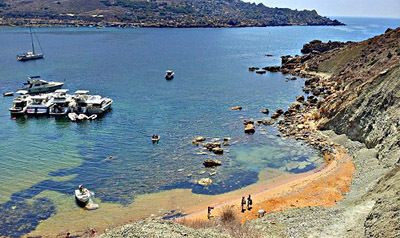 Here’s his round up of what he likes most about Malta however many return trips he makes to the Islands. I like the fact that while Malta is one of the most densely populated pieces of real estate in the world, a veritable rabbit warren afloat on the sea, Malta still has secluded beaches. And places you can contemplate the profound depths of history. But if you find the quiet of those spots starts getting to you, the place crawls with restaurants, shopping centres, spas, and just about everything else in quantities great enough to enjoy an entire life (or, alas, just a fortnight) of travel and leisure. Just to illustrate though how much it has to offer, Malta’s the kind of place where hotel amenities regularly include several centuries of history alongside a pool, not to mention splendid luxury. I’m often able to find cheap flights there, and there are regular ferries, if you like a little transportation variety. And there’s the weather, which is about as good as you’ll come across most times of the year. Top destinations include the town of Valletta, sitting on a scenic finger of land and doing double duty as Malta’s capital and one of its three World Heritage Sites. Mediterranean coastal towns run the risk of sinking under the weight of superlatives, to the point where I can’t talk about their charm without feeling cliché-ic. No matter how many of these places I’ve seen before, however, I never regret a visit to Valletta. With a car rental, you can escape to the Delimara Peninsula, a world away from the bright lights of the little city. Driving is also a good way to see The Megalithic Temples of Malta, which not only roll off the tongue; they’re also on the World Heritage Site list. Consisting of eleven stone monuments up to seven thousand years old, wandering them is like voyaging the seas of time. Speaking of old stone and seas, don’t miss Dwerja, a coastline of fantastic limestone formations. My Maltese favourite happens to be the Hypogeum of Hal-Saflieni. The name alone conjures something arcane and exotic – a port of call where interstellar cruises disembark in some science fiction novel, perhaps. As unique as its name, it’s the world’s only known example of a subterranean temple built in prehistoric times. It had a long and varied history, beginning as a temple, or perhaps the home of an oracle, but was later converted into a necropolis where eventually 7,000 souls were laid to rest. You can still see some of the remains today. The chambers lie on three different levels. This first is the main ossuary. The second, to me is the most interesting, with walls cut from limestone so skillfully they resemble laid stone, rather than carved rock. The second level contains what I think are the most interesting rooms in the whole Hypogeum. The name of the Decorated Room speaks for itself: curving walls are covered in swirling designs, evocative of lost dreams and forgotten ancient beliefs. The ochre paintings in the Oracle Room are just as fascinating, but the real attraction there is the acoustics of this odd little gourd-shaped chamber. It’s easy to imagine a whispering oracle crouched in this dark spot under the uncanny swirling paintings designs, uttering prophecies magnified by the very earth itself. Easy, because you can try out the acoustics yourself. Perhaps most impressive is the age of the structure. The Hypogeum was constructed during the Bronze Age, around 4,500 years ago. Think about it: 500 more years will have to pass before our Gregorian calendar is just half as old as these chambers. And remember, Bronze Age. No iron to cut and carve Malta’s hard limestone back then. The ancient masons did it all with flint and obsidian. To achieve such workmanship with such tools is another reason the site is famous. That the Hypogeum lies essentially directly beneath a thriving metropolis not only makes it weirder, it also makes it extremely easy to visit. Multiple buses run from near all the hotels in Valletta past or very close to the Hypogeum. And once you’re done with your tour, the Tarxien Temples, definitely worth a visit in their own right for their intricate stone carvings, are a short stroll away. That’s one of the things I love about Malta, it’s so small, you can see a lot in a single day, and still have time to soak it all in without feeling rushed. The only catch is that Heritage Malta, which runs the site, only allows 60 people a day to tour the Hypogeum. So, be sure to plan ahead! There’s an old saying on Malta, “A kiss without a hug is like a flower without fragrance.” No one place in Malta is far enough from the water that you don’t get the fragrance of the sea in each breath. The little island country truly is a flower, where you can breathe deeply of the ocean of history. Michael Roberts’ love of travel began at a young age, when his historian father regularly took the whole family on holidays to Malta. Refusing to grow up being an integral facet of the successful travel writer, he spends trips ferreting out forgotten historic sites, contemplating their grandeur, and then writing about them for websites like Travel Republic.